On the final page, the story circles back on itself to its very beginning. The Terminator-lite “Stalker,” the Shrike (named after “the butcher bird that spikes its prey on thorn bushes”),  has retired from pursuing Tom and Hester throughout all four books to sit in a Rodin’s Thinker pose and wait for someone to talk to. In the far-flung future, a bunch of agrarian quadroons with “honey-colored” skin, brown hair, and brown eyes (in stark, deliberate, and pointed contrast to the white protagonists, villains and yellow Anti-Tractionists) are enjoying a plentiful, peaceful existence in the way that Africans and mulattos generally don’t. When Shrike’s had enough pondering the imponderables, he starts to narrate Tom and Hester’s story to the fascinated and bemused audience of Starbucks-ready, perfect, mixed-race people. Thusly, Tom and Hester’s journey taken as a whole is a flight from crazy, power-mad white men and their crazy, city-eat-city Darwinistic model of life, to the relative safety of saner, mercantile Chinatown-in-the-sky, to eventual death in a wasteland, only to be replaced by amicable, empty-headed Third-Worlders with no history, no concept of history, and no means of production beyond subsistence farming. Take that, Wypipo! Right in your stupid, science-loving faces! 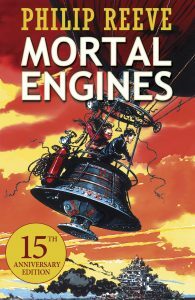 In this sense, throughout the series Mortal Engines is a commentary and weak apologia for panmixia and a limp-wristed universal altruism. In the words of Mike Enoch, to counterbalance “the profound negative consequences of diversity . . . the mixing has to be justified,” yet Reeve offers no justification for it beyond a “gotcha” on the final page that describes a nonsense community of brain-dead brown people. The setting and use of steampunk (itself being a throwback and homage to white ingenuity), coupled with constant negative stereotypes of whites (the only race it’s acceptable to demonize in mainstream literature), add up to Mortal Engines being a liberal attack on whites acting in their own interests. A Google search for “Philip Reeve humanist” turns up other commentators who have a similar reading: Cambridge University Professor Peter Hunt states the Shrike expresses “what seems most to be feared in the modern world: a capacity for inhumanity and violence; scientific inquiry harnessed to serve imperial power, and the ethical vacuity of those in power.”  If self-defense is not an “ethical” use of scientific power for whites, is there any way we preserve our existence without being “inhumane”?